Over 16,500 cosmos flowers are in full bloom at the Meiti Riverside Park! According to the Hydraulic Engineering Office (HEO), the landscape is designed to give visitors a sense of warmth and welcome. Two gigantic teddy bears are placed at the entranceway of the park, and the smooth road of flowers wishes visitors a pleasant future. The cosmos flowers blooming alongside the road and riverbank decorates the surrounding in shades of yellow, white, and other colors. HEO pointed out that the Cosmos bipinnatus and Cosmos sulphureus originate in Mexico, with blooming seasons starting in late summer and early autumn. From now until mid-November, visitors will be able to see the flowers in full bloom. 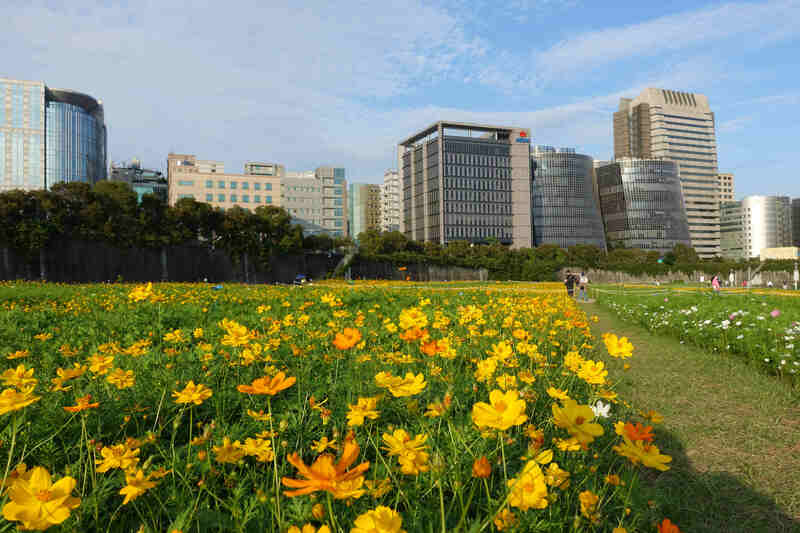 The cosmos flower season is expected to last through mid-December. To encourage the public to visit the riverside parks, HEO is holding a raffle event offering prizes ranging from ipad to GPS wristbands. Individuals can take a picture of themselves with the backdrop of flower scenes at the following locations: Meiti, Dajia, Zhongzheng, or Rainbow riverside parks. Upload the photo to related discussion thread on the Facebook fan page of the activity (see below) and include a message “@location” (location=place where the photo was taken). The agency also reminds visitors to watch their footsteps when taking photos with the flowers and avoid stepping on the plants.